January has come to a close. Raise your hand if you're still on a healthy kick. Raise your hand if you want to give me a healthy kick for talking about your diet. 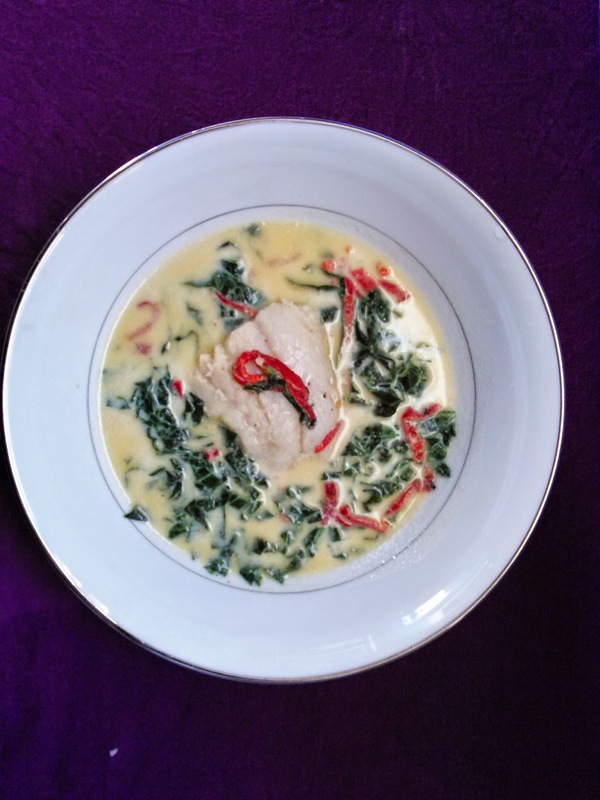 Either way, I still want you to be healthy, so I'm presenting this Milk Poached Cod for this week's #WeekdaySupper. You can make this restaurant-quality dish in 20 minutes or less! 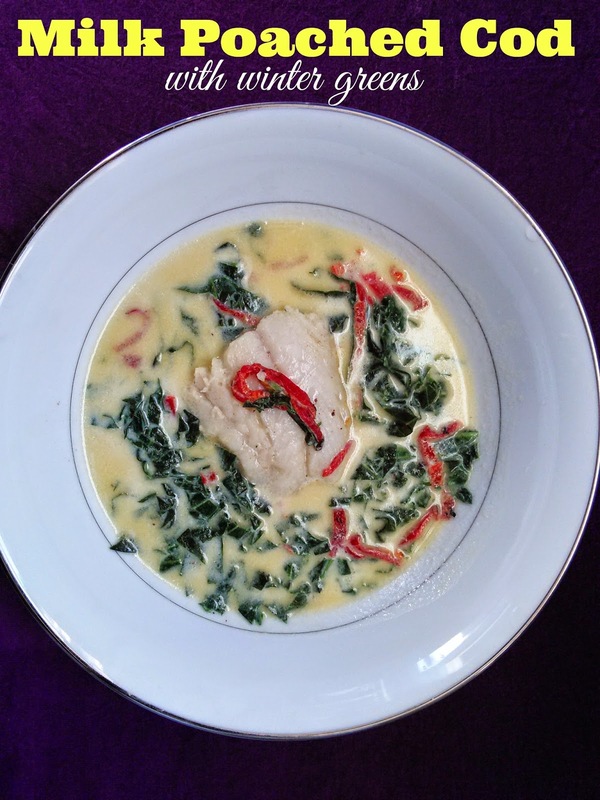 Flaky cod is bathed in a buttery milk broth and simmered with fresh greens, roasted red peppers and minced garlic for a light, quick dinner. Technically, it's a soup because of the broth, but I just call it "ahhh-delicious." Are you ready for this incredibly simple meal that will be ready in the blink of an eye? I thought so. A little bit of chopping and one pot is all you need to get it done. Easily substitute coconut or nut-based milk for a richer flavor. Firm-fleshed fish and seafood like sea bass, swordfish, halibut, scallops and shrimp are also great substitutes. Most any green can be used in place of collards: kale, mustard, turnip, beet, chard, watercress, arugula, radicchio and even carrot tops can change up the flavor and texture of the dish. I have to share with you: This is my 400th post on Nik Snacks. I did a little math (boy, do I hate math) and that puts me at ONE post a week on average (but boy, do I love blogging) over a six year period. I usually take a yearly blog hiatus of about 3 months but for 2015, I'm making it a personal goal to thug it out and soldier on through the winter to bring you recipes that inspire me and make me want to make you want to eat. My blog is not the sum of its parts as is just a small fraction (gahhh, more math!) of my little multimedia business over here. So whether you're a long-time fan, a first-time reader (hi! ), an email subscriber (thank you!) or a repeat offender (two thumbs up), I appreciate you! SO--Open up that menu planner of yours (you know you got one for Christmas. Go ahead. Break it out) and put down this and the four other #WeekdaySupper recipes for you and your family to enjoy this week or next. Sprinkle salt and pepper on each side of the cod fillets and set aside. Heat the oil in a large skillet over medium-high heat. Sauté the roasted red peppers and garlic, until tender, about 2 minutes. Add the butter, milk, and ½ teaspoon salt to the skillet and bring to simmer. Gently place the fillets into the milk broth. Cook for 5 minutes. Flip with a slotted spoon or fish spatula and cook for another 3-5 minutes, until the fish flakes. Remove the fillets from the broth and place each in a wide soup bowl. Add the greens to the skillet. Continue cooking until the greens turn bright green and are crisp tender, about 5-7 minutes. Evenly spoon the broth with the greens and peppers into each bowl. This looks and sounds absolutely delicious! I'm still on my health kick :) Been going strong and don't intend to quit! I will have to try this recipe out, Grumpy's favorite fish is cod, so I am happy to have a new recipe that I can make for him! This looks really great actually and I can see this soup in my near future! Thanks for sharing! Yum! This is totally up my alley. I'm going to try it with coconut milk! Congrats on your 400th post!